How can I detect more ions in my samples? There are 2 sections of the workflow in Progenesis that control how many ions are detected in your data: the first is the filtering performed at Import Data; and the second is the peak picking parameters used at Peak Picking. Start a new experiment in Progenesis QI as you would normally, ensuring to select the appropriate data settings and required adducts. 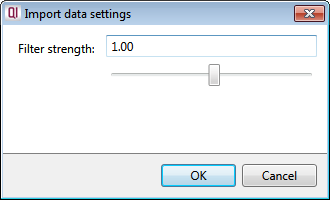 Edit the new filter strength required – the setting of 1 is the default strength, a setting of 0 is no filtering applied, and a setting of 0.5 is half the strength of default. Once you’ve entered the new filtering strength, click OK. This article is intended for use where you wish to increase the number of ions detected in your data, but should you wish to reduce the number of detected ions for data sets with high levels of background noise, the same instructions apply. For example, a setting of 2 is equivalent to 2x default filter strength and will accordingly result in fewer ions detected. 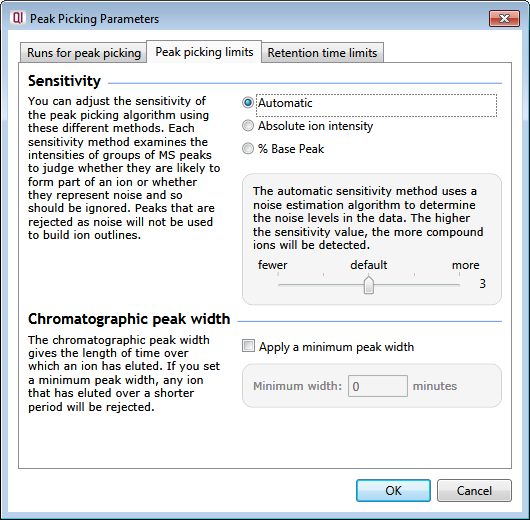 The default settings used at peak picking aim to detect as many “true” ions as possible while ignoring any potential noise or contamination. On occasion, however, it may be necessary to edit these settings in order to detect more (or fewer) ions. The top section relates to the sensitivity of peak picking with 3 options: Automatic, Absolute ion intensity, and % Base peak each with configurable settings. The Automatic sensitivity method uses a noise estimation algorithm to determine the noise levels in the data. The higher the sensitivity level, the more compounds ions will be detected. The default setting is 3 and will go as high as 5 (and as low as 1). For the Absolute ion intensity method, groups of peaks with an absolute intensity level less than the given value are ignored. Intensity levels from the aggregate run are used and the units, typically counts, are determined by your MS machine. Entering a value of 0 is the most sensitive setting for peak detection so will result in the maximum number of ions being detected. Using the % Base peak option, peaks with an intensity less than a given percentage of the most intense peak are ignored. Intensity levels are compared in the aggregate run. Entering a value of 0 in here will also result in the maximum number of ions being detected. Once you’ve chosen the appropriate method and made changes as necessary, click OK to close the window. Note: If you’ve already carried out peak picking on this data set, you’ll be asked if you want to clear existing compound ions and start again – click Clear compound ions and start again. 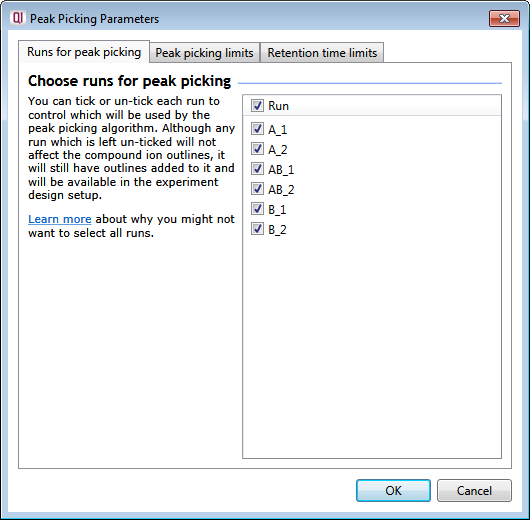 To start the peak picking using your modified parameters, select Start peak picking.